Sammy Hagar is sending fans Christmas greetings from Hawaii. 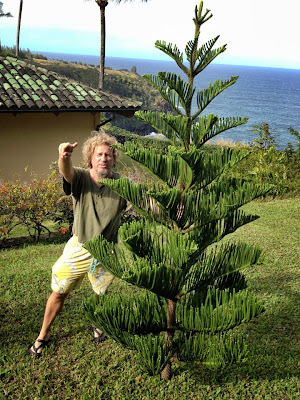 The Red Rocker has posted a photo of himself in the tropical paradise where he has one of his several homes. In a holiday message this week, Sammy revealed that he is hoping to get out and play some live shows, maybe even a full tour. 2013 marks Hagar’s 40th anniversary in rock based on the 1973 release of the debut Montrose album. Back in May, Sammy announced plans to test drive a new format for his 2013 live shows. Billed as “4 Decades Of Rock,” Hagar’s plan is to build an evening featuring highlights from his lengthy career. Sammy & The Wabos would open the show, followed by The Other Half (including former Van Halen bassist Michael Anthony); a Montrose tribute set would be next, and then the evening would wrap up with Chickenfoot. Hagar’s September 1 show at the Lake Tahoe Outdoor Arena at Harvey's in Stateline, Nevada was the first event with the new format.